Five centuries ago, skiing was invented by the Norwegians to hunt game in the snow. While it has lost this essential, animal function, skiing has retained all of its primitive essence. Skiers still hunt – but this time, escapism. Quenching their thirst for discovery. Leaving their comfort zone by facing the unknown. Skiing has become the most loyal ally of modern-day trappers ever in search of authenticity. This is the pioneering spirit. At Dynastar, this essence feeds our philosophy. This essence is reflected in the wood of our Mythic range. A ski designed to accompany gold miners, or should we say white gold miners. Those looking not for a cushy deal but the perfect line. The adventurers seeking an El Dorado, as long as it's cold and snow-capped. This winter, the F-Team El Dorado has a name: Georgia. Riding in the Caucasus to make skiing a pathway to escapism. Sliding into the unknown. As a team. Always. "I wanted to share this adventure with friends. Here, the skiing culture is so raw and pure. They're still in the early stages of their development. It's only just beginning." The F-Team of Sophie Lechasseur, Marie Pierre Prefontaine, Forrest Coots and Vivian Bruchez set off to roam Mestia Valley for ten days. Two Canadians, an American and a Frenchman. Three freeriders and a steep skier. While their backgrounds varied, all were seeking to devote their individuality and qualities to the common good to clear the way in this extraordinarily promising land. Sophie took on the guide role as the only participant having already tackled these mountains in the outer reaches of Europe. THE OUTCOME OF THE TRIP WAS THE PROMISE TO COME BACK. AND THE EXCITEMENT OF TURNING YOUR PASSION INTO A PASSPORT TO THE UNKNOWN. LET'S GIVE VIVIAN THE LAST WORD. "I SEE SKIING AS AN EXCUSE TO EXPLORE. IN GEORGIA, I UNDERSTOOD THE REAL MEANING OF DISCOVER." The legendary touring ski's reputation has preceded it since it became a must-have among the community of skiers seeking adventure and escapism. Its construction combines Carbon C-Ply technology with a Paulownia wood core, promising a light ascent (2800 g/pair). An invitation to take a look at what lies behind the next peak. "The Mythic 97 Carbon is my favourite ski because it allows committed skiing and the exploration of uncharted territory. Whether that's in the resort or setting off on an epic adventure." 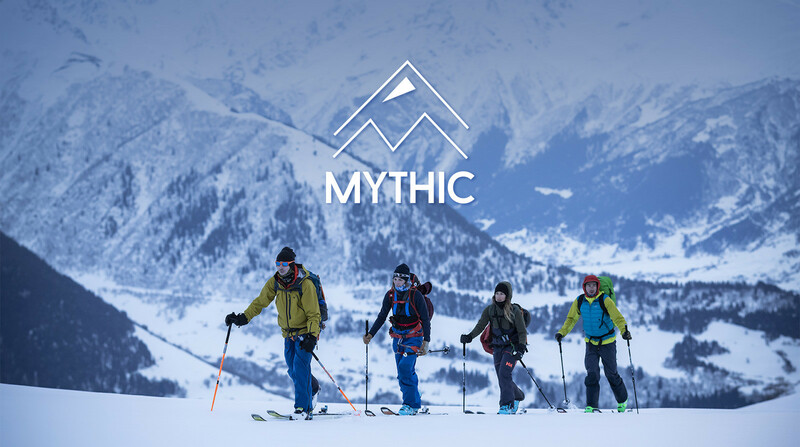 The Mythic 87 is a high-performance touring ski perfect for experienced skiers looking to discover a new approach to the mountains and commit more fully to the practice. Its Paulownia wood construction promises lightness on the ascent while its progressive rocker ensures a level of performance comparable to freeride skiing on the descent. An essential for your next trip where committed skiing meets cultural discovery.